After six months in the Scarborough General Hospital on a feeding tube in 2009, I was accepted into Cardinal Ambrozic Houses of Providence and moved in there in January 2010. At SGH, I had a fractured hip repair surgery, followed by complications which led to peritonitis, being on and off life support, a colostomy, hernia repair surgery, a tracheotomy and swallowing difficulties leading to having feeding tubes through my nose later surgically inserted into my stomach. During my stay at SGH, I contracted MRSA and was kept in total isolation. Besides full reversals of my tracheotomy and feeding tube, I was also later cured of MRSA without drugs or supernaturally. Many thanks to God, Our Lady and all the Saints and Angels who helped me, all who prayed for my recovery, and the SGH for all the care I received during my stay. 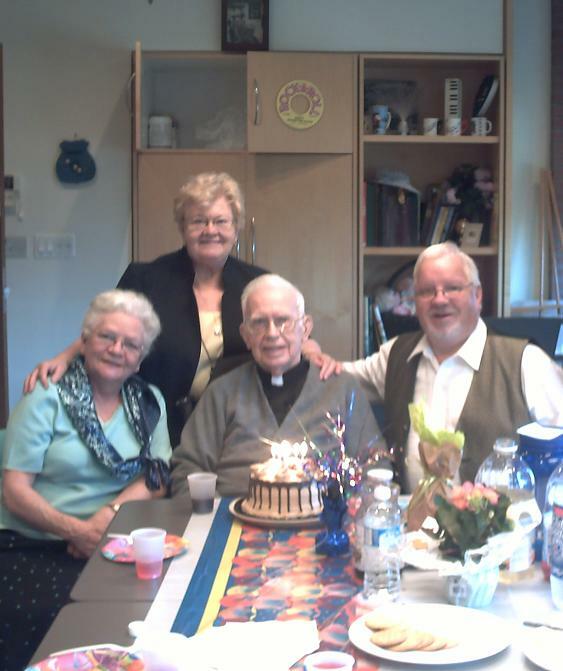 As I just celebrated my 77th ordination anniversary on June 3, 2016 and happily approach my 101st birthday, I object to and it is wrong that our tax dollars here will now be paying for murder-suicide through “medically assisted death service”, as announced yesterday by Ontario Liberal premiere Kathleen Wynne and Ontario Minister of Health and Long Term Care Eric Hoskins. I am grateful to Cardinal Collins and the many millions of others speaking out against this evil of euthanasia, supporting palliative care and for conscience rights for medical health care professionals and providers. 11This commandment, that I command thee this day is not above thee, nor far off from thee: 12Nor is it in heaven, that thou shouldst say: Which of us can go up to heaven to bring it unto us, and we may hear and fulfil it in work? 13Nor is it beyond the sea: that thou mayst excuse thyself, and say: Which of us can cross the sea, and bring it unto us: that we may hear, and do that which is commanded? 14But the word is very nigh unto thee, in thy mouth and in thy heart, that thou mayst do it. 15Consider that I have set before thee this day life and good, and on the other hand death and evil: 16That thou mayst love the Lord thy God, and walk in his ways, and keep his commandments and ceremonies and judgments, and thou mayst live, and he may multiply thee, and bless thee in the land, which thou shalt go in to possess. 17But if thy heart be turned away, so that thou wilt not hear, and being deceived with error thou adore strange gods, and serve them: 18I foretell thee this day that thou shalt perish, and shalt remain but a short time in the land, to which thou shalt pass over the Jordan, and shalt go in to possess it. 19I call heaven and earth to witness this day, that I have set before you life and death, blessing and cursing. Choose therefore life, that both thou and thy seed may live: 20And that thou mayst love the Lord thy God, and obey his voice, and adhere to him (for he is thy life, and the length of thy days,) that thou mayst dwell in the land, for which the Lord swore to thy fathers Abraham, Isaac, and Jacob that he would give it them.” (Deuteronomy 30:11-20). In 2010, I was happy to celebrate my 95th birthday at Providence Healthcare after six months in the hospital.